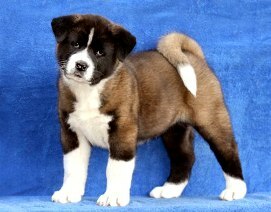 Are you interested in a puppy from the Pearl River Kennel Akitas? Our breeding kennel Pearl River is a registered by FCI. As a result, all our puppies come with pedigree. We have been breeding American Akitas for over 19 years. In that time we have acquired and gained a lot of experience – not only with our dogs , but also with dogs from other breeding kennels we’ve been in touch with over the years . These include many American breeding kennels. I personally spent almost 8 years of my life in the United States where I studied intensely the breeding of American Akitas since I planned to revive the breed in the Czech Republic through dogs born in America. There were many good reasons for this. Czech dogs were greatly affected by the period when the American type of Akitas had not corresponded with the new standard of Akita Inu, and there had been much cross- breeding between the two types. Another reason was genetic – to bring new unrelated blood for strong genetic recovery: until recently only a small number of dogs were being used for breeding. Therefore, it was necessary to extend the breeding base by unrelated individuals. Last but not least – in the U.S. I fell in love with the even temperament of this breed; unlike in the Czech Republic, America seemed to be void of aggressive Akitas or those with significant behavioral problems as us. When I started my search for a replacement for my first American Akita, the dog Cedric who passed away at the age of 10 and I missed him terribly, I started to communicate and collaborate with American breeding kennels. After a long and careful selection we gradually brought to the Czech Republic three puppies from good breeding lines. And after all the many years of experience and work with the American Akita , we finally decided to breed ourselves puppies of this beautiful and loyal breed. I am a graduate of zoology and ethology focusing on canines. Dogs have been accompanying me throughout my life. At the age of 7, after much work I managed to convince my parents to get for me my first dog – a German shepherd who strengthened my deep love of these animals . For years I studied dog behavior and ways of correcting their problem behavior and later deepened my studies at the Faculty of Science of the Palacky University in Olomouc, Czech Republic. I completed my studies with a thesis on "Ecology and Ethology of canines focusing on the wolf (Canis lupus)". I also spent months the behavior of wolves in the American wilderness. All this experience I am able to apply to the education of dogs and to the correction of their problematic behaviour. All our dogs receive first-class care. They are raised on the basis of years of professional work experience in the fields of zoology and ethology . We are dedicated also to their mental side when we seek to provide the greatest possible amount of external stimuli and experiences so that their lives are full and happy... We take our dogs mountain trekking, descend rivers in a canoe, and accompany us to work. Our great care is also illustrated by our dogs‘ achievements in various exhibitions . We're not trying to make puppies at any cost . Our top priority is their health. All our breeding American Akitas have zero dysplasia of the hip . Our puppies are the result of long planning and selection of the stud dog is top priority. Our dog "Ike" Torazo's Pearl Ike Warrior (import USA ), who lives in our breeding kennel, was used as the stud dog in litters B and D. This dog fully meets our high requirements and demands of the stud dog . He has zero elbow and hip dysplasia. He is of a very balanced character , friendly, discreet and quiet , which corresponds to the typical temperament characteristics of this breed. Also his exterior fully meets the standards. This is illustrated by our show results from the 2009 World Exhibition, the 2010 European Exhibition, and many other international , national and club shows he partook in. He received a large number of show awards and championships. From the litter B with our female Gimi we kept both the females Dessi and Lucky who despite their young age have already gained a large number of titles and championships. They both have zero dysplasia of the hip joint (0/0) and zero dysplasia of elbow joint (0/0) and negative tests for OCD of the shoulder joints . Due to the lack of suitable sires and the need for further expansion of genes , we decided to mate our Kentucky-born female Alchemist Dream Kentucky Pearl (litter C ), back in her home country of USA. Selecting the stud dog was very difficult. Finally, the victor was a dog from the American breeding kennel Keepsake Akitas called Ch Mariah 's Check and Balance "Checker". He is of a very sweet and balanced character, with zero dysplasia, from bloodline very successful at shows who himself has won many accolades. In advance of mating we investigated not only the origin of his parents, but also his siblings and his offspring . From this litter we kept two puppies in co-ownership: the girl Cristie and the boy Cappy. They both received a number of awards at shows. Cappy is also actively involved in rescue training. He has already passed his obedience exam and is now preparing for the next one. Our next litter D was by the female Kentucky with the male Ike and our last litter E was by the female Dessi with the male Sewer from Poland. Puppies from these litters also bring us much joy and have already won a range of awards. Currently we are planning to mate our female Mitchell. We have selected for her a very successful stud dog that meets our high demands for health as well as for temperament. Mating will take take place in America. All of our puppies are microchipped, regularly de-wormed, vaccinated and have been issued a passport. When transfering the puppies, we seek to pass to the new new owners as much of our experience as possible and to explain to them how to take care of a puppy, what to feed it, how to bring it up and prepare for exhibitions. Also, we stand always ready to advise and help you solve any problem that may arise later on. New owners can contact us for help at any time. We help them also with exhibiting and raising their puppies. Puppies that leave us slightly more mature are already fully prepared to assume their place in the new family. They are completely house-trained, educated to cleanliness and well socialized. All puppies are reregularly trained, from their second days of life, with anti-stress exercises and taught how to cope with new unexpected situations. New and especially less experienced owners are therefore spared most work with a small puppy that needs constant supervision at a very important and challenging period of socialization. A careful selection of new owners of puppies is no less important for us. Until we find an appropriate home for our puppies, they stay with us. Happy future of our puppies is our major priority. We remain in contact with all owners, in order to know how our puppies fare. We certainly do not want our puppies to be kept in pens for a long time; they must be an integral part of the family, that’s one of our conditions. We never sell puppies to middlemen and traders. If someone wants to sell our puppy, they must first offer it back to our breeding kennel. In that way we want to make sure that our puppies do not become the subject of trade.